At Kaufman Eyecare Center, we know that selecting eyewear can be a challenge. This is why we offer a large selection of eyewear, eye glasses, contact lenses and sunglasses to guarantee you will find the combination to suit your individual needs. Our trained professionals are available to assist you in selecting the best lenses or frames to help you see well, feel well and look great. Our full service Optometric office is fully designed to meet both your eye healthcare needs and your eyewear requirements. We take the time to discuss how different lens selections and frame styles will impact your vision.We carry designer frames, "funky/retro" fashion and a more traditional line...yes we have something for everyone. Our contact lens technicians are qualified to assist the Doctor with determining which Contact lenses are right for you and how it wil fit into your lifestyle. For example our office carries Multi-focal, RGP's (gas permable), toric, daily and monthly lenses. In addition to that line there is an array of color lenses to choose from. Let us help you discover what is the right "fit" and design for you. 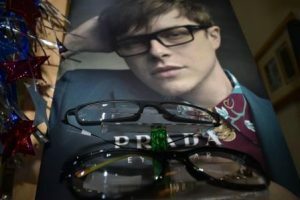 Our technicians will help you narrow down your selection to the eyewear that fits your lifestyle and your prescription. Whether you are shopping for designer sunglasses or practical frames we have a variety of designs, colors and shapes – to suit any face or fancy. We encourage new clients to visit us with their current prescription to allow us to help you "see" the new you. So just come on in we are here for you! Dr. Kaufman is an exclusive legal provider of Medicare glasses for post cataract surgery. After your surgery, Dr. Kaufman will save you time, money and hassle, and will help you get your glasses through medicare. Look Great, and See Better!